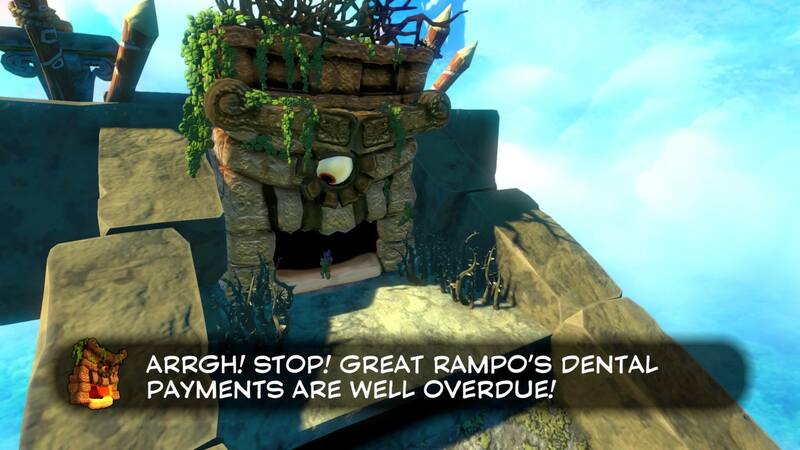 Knock some teeth in the battle against Rampo in Tribalstack Tropics. In Yooka-Laylee, the first boss you’ll face is Rampo in Tribalstack Tropics. Not only is this boss tricky to find, but he’s also tricky to beat if you don’t know the correct way to fight him. To help give you an advantage in your fight against Rampo, we’ve put together a quick guide on where to find Rampoa and how to successfully beat him. You can find Rampo at the top of Rampo's Castle once you've exanded the Tribalstack Tropics Grand Tome. 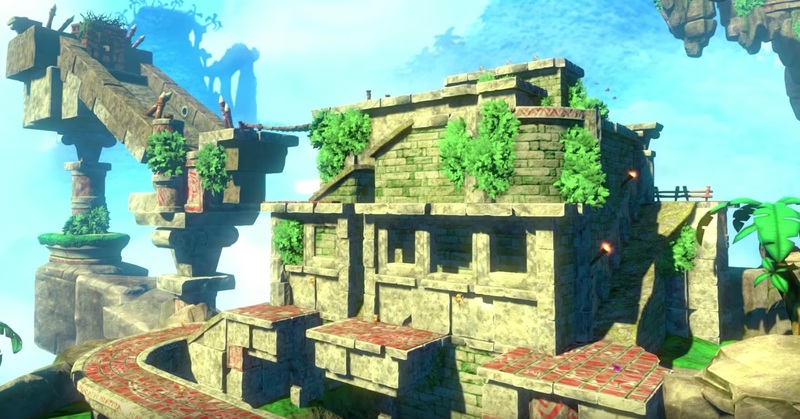 To find Rampo in Yooka-Laylee, you’ll first need to expand the Tribalstack Tropics Grand Tome for a total of 3 Pagies. Once the Tribalstack Tropics Grand Tome has been expanded, load into the game and look to the left of your spawn point. There, you’ll see a ruined castle with a ramp leading up and around it. On the ramp, you’ll find various hazards including flames and Corplets. Proceed to climb all the way up to the top of Rampo’s Castle and after crossing a wooden bridge, you’ll encounter The Great Rampo. He’s easy to spot and kind of reminds us of a one-eyed version of the air conditioner from The Brave Little toaster. To defeat Rampo in Yooka-Laylee, you'll need to knock out his teeth. 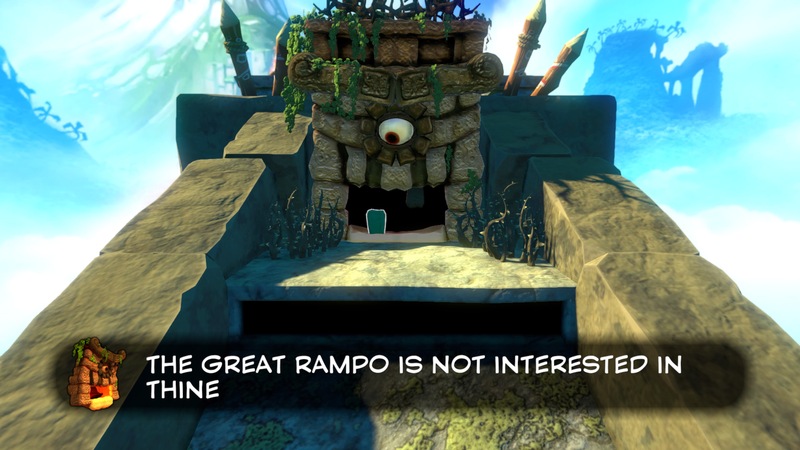 Once you’ve tracked down The Great Rampo in Tribalstack Tropics, you’ll need to defeat him. He may not be the hardest boss to defeat in Yooka-Laylee, but he certainly hides a few tricks behind his broken smile. To successfully beat Rampo, you’ll need to last through three different stages. During these stages, you’ll need to do two things. One, make your way up a ramp while avoiding a series of rolling logs. Two, knocking out Rampo’s remaining teeth while also dodging the flames he spits out. During the first stage of the Rampo boss fight in Yooka-Laylee, the logs will tumble down the ramp in a zig-zag pattern. Here, you can either dodge between them by rolling, or by remaining rooted in place and jumping over the logs while in a rolling position. After reaching the top of the ramp, you’ll need to jump one final time to get over the raised platform. Next, get close to Rampo’s face and dodge the flames shooting out of his mouth by jumping over them with your double-jump. Finally, knock out his two remaining teeth using a melee attack. Stage two of our battle against Rampo in Yooka-Laylee is similar to the first stage. You can continue to avoid the logs by either using your Reptile Roll move, or by staying in place and jumping the logs while in a rolling position. After reaching the top, you’ll be tasked with the same mission as the first stage. Avoid the flames pouring out of Rampo’s mouth by double-jumping. Then, knock out Rampo’s exposed teeth using a melee attack. To beat Rampo, continue to avoid his flames as you knock his teeth out. Last but certainly not least, stage three of the duel against Rampo in Yooka-Laylee requires you to have solid timing. This is mainly because it’s easy to make a mistake and get clocked by a wayward log. It’s important that you stay frozen in place, assume the rolling position, then continue to jump and move forward at the same time to avoid the logs. After reaching the top, you’ll do the exact same thing you did in the previous two stages. Avoid the fire that Rampo spits out, then close in and smash out Rampo’s remaining teeth. At the end, you will have officially beat Rampo and will be awarded a Pagie for your troubles. By following this guide, you should now know where to find Rampo in Yooka-Laylee and how to beat him.